Pani puri is one of the best Indian spicy chats. It is known for its sweet and spicy flavours. No matter where we go in India, we can find small vendors in the street corners selling these little bites of yummly savories. 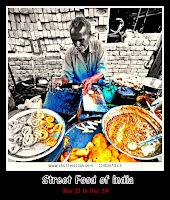 Pani puri or golgappa has its own style.Unlike in restaurants where it is served in a big plate with all the ingredients, the street vendor serves it in a totally different way. A small bowl is given to the customer and he is all ready for the challenge.I love this style and let me tell you how it works. The chat vendor/chat walla takes a puri,makes a hole,stuffs the stuffing inside,dips the whole puri in a big earthen pot of juicy pani and fianlly puts it in your bowl.All these things happen in a fraction of a second.He moves so fast you can barely notice him doing this. The challenge of the customer is to eat the whole puri before the vendor gives you another in your bowl.After biting into it,you are so lost in thought that you often forget that you should eat it fast and your next puri is on your way into the bowl.All the sweet and tangy juices fill your mouth and the taste will be heavenly. Puri - Dough in the shape of a small ball ,fried in oil. Pani – Sweet and spicy water made from various ingredients. Stuffing – Mashed potatoes,onions,chat masala,red chilli powder,salt. Combine maida, rava, baking soda and salt in a large container. Add very little water and start kneading the dough with your hands. If the dough is hard then add more water until you get a smooth and soft consistency. Allow it to rest for around 20 min. Knead the dough once again and make small balls. Using the roller, roll out the dough into a thin layer .Now cut out a small round shape ,about half the size of your palm with a mould or the back of a lid. Heat oil in a pan and add the puri one by one.Afetr it turns into light golden brown, turn it over using a ladle.Press the ladle in the center and along the egdes to make the puris puff up. When both the sides are done,take out the puris and place them on paper towels to drain excess oil. Tamarind – the size of a small lemon. Soak the tamarind in ½ cup of warm water for about 10 mins . Mash them well and strain out all the pulp through a sieve. Combine this pulp with the remaining ingredients namely chat masala, roasted jeera powder, mint, coriander leaves .Grind them to a fine paste. Transfer the paste into a large bowl and add 2 cups of water, salt and mix well. Refrigerate for about 10 mins for the flavours to blend well. Do not freeze. Boil the potatoes until they are cooked fully. Chop the onion into very small pieces. In a large bowl mash the potatoes well. Add the diced onion, salt,turmeric powder, chilli powder and masala powder. Mix them well. Make a small hole in the centre of each puri. Insert a small amount of the mashed potatoes stuffing . In a small bowl,pour the pani.Now dip each of the puris with the stuffing into the pani so that the pani goes inside the puri. Now put the whole puri into your mouth. i didnt know how to make pani... thnx dear...how do u make sweet chutney.. I will update the recipe for sweet chutney soon..
Pani Puri is my fav chat. Your mouth watering pictures invite me to do this recipe..i have one doubt.u said to use sooji for making puri,can i use maida instead of sooji ? Thanks for visitng my blog Nancy. You can use maida but the results would differ.Using sooji would give you the exact texture of crispy puri which we get in chat shop.You can use half maida and sooji if you want.I will try it out and let you know. Thanks a lot Rosh :) Happy to participate in your event. 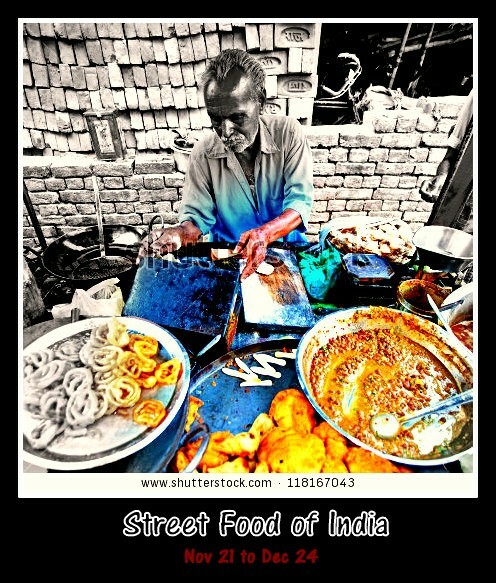 Lovely very detailed post....simply love it..
Love Pani puri anytime.. Nice picture.. 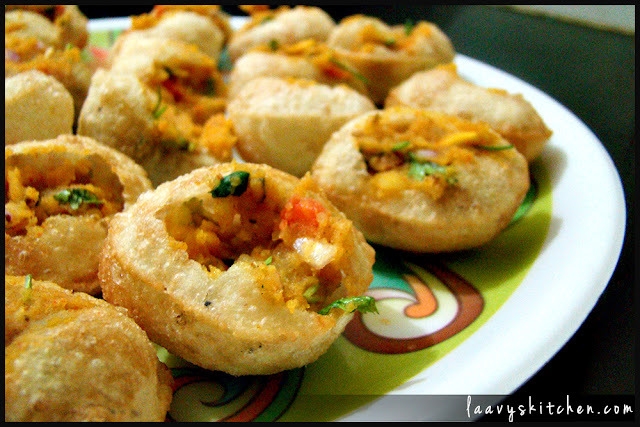 It is good recipe.I love pani puri.